More than half of restaurant fires start in the kitchen and many of these force operators to close their business for good. FEJ hears why fire suppression systems are the proactive insurance policy that the whole industry needs. Foodservice operators might be guilty of viewing kitchen fire suppression systems as a grudge purchase, but anybody who has ever been unfortunate enough to need one activated will know that the potential cost of not having such a provision in place can be catastrophic. As you’d perhaps expect, this is a market sector where developments are driven heavily by regulation and compliance. 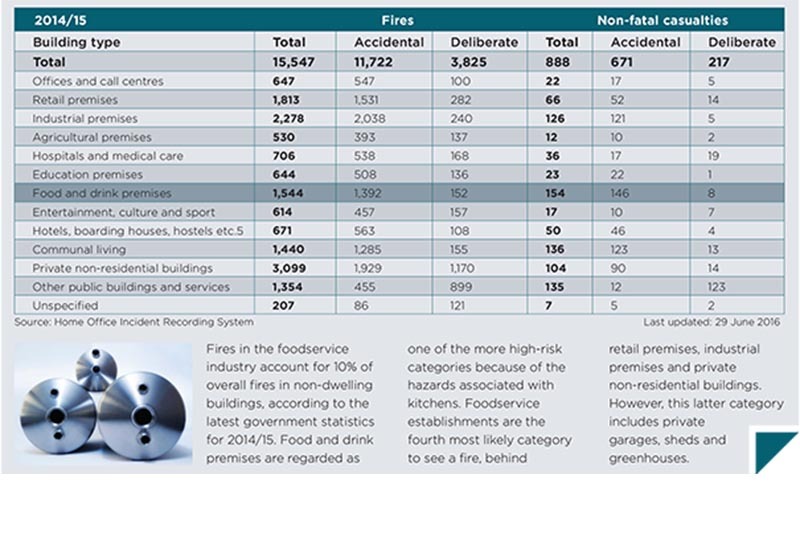 The Regulatory Reform (Fire Safety) Order 2005 is one of the key catalysts, while insurance companies have made fire protection a condition of insuring properties where commercial cooking takes place. As the emphasis on adequate fire protection has increased, so too has the number of systems now available on the market. 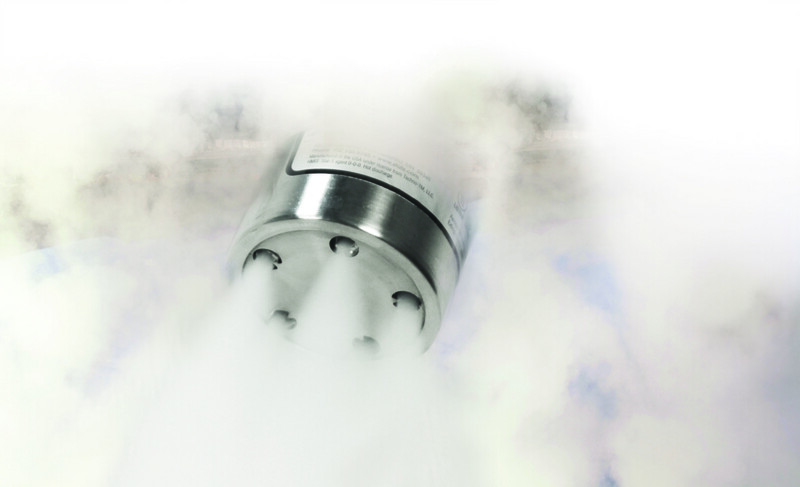 Wet chemical products — generally considered to be the more cost-effective solution to install — continue to dominate the market but high pressure watermist systems are also gaining ground. 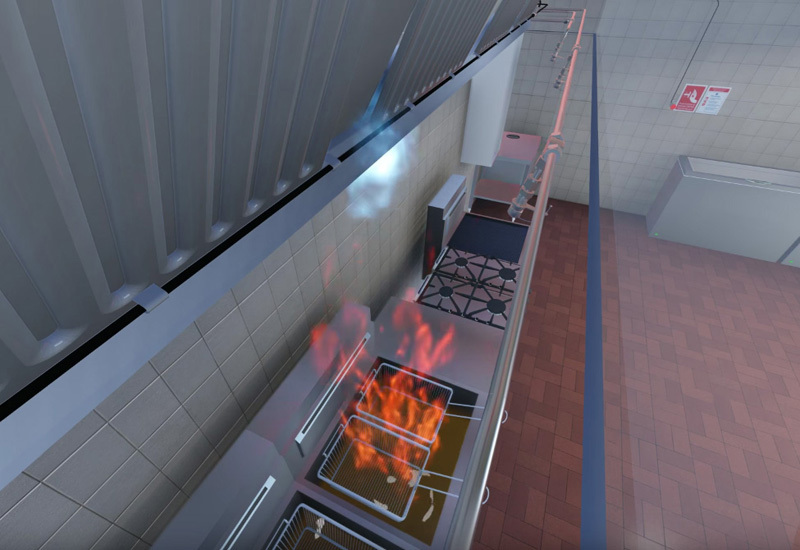 Jan Waldow, product manager for pre-engineered systems at Tyco Fire Protection Products, thinks that awareness of the risk and impact of kitchen fires has continued to increase over recent years, and the driver behind this is typically a greater understanding of their causes. One company well-placed to judge the direction the market is moving is Nottinghamshire-based FSE Fire Safety Systems, a distributor and installer with more than 30 years’ experience. 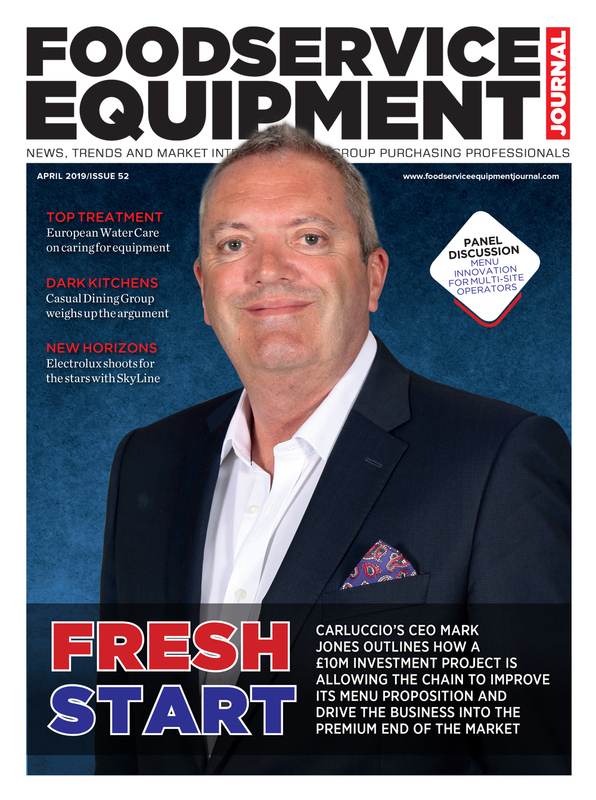 Managing director, Stuart Rye, says it has noticed some significant changes in the fire suppression market over the last five years. 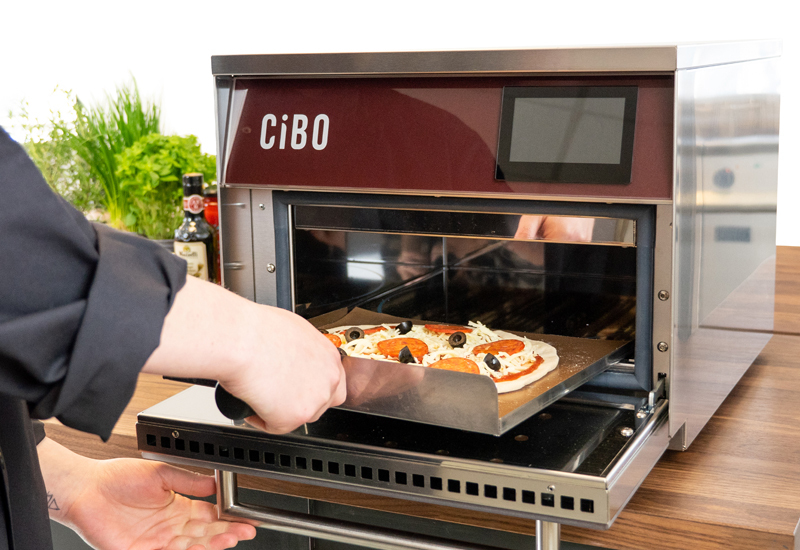 “As a distributor/installer we have seen an increase in demand for watermist-type systems for restaurants, demand interestingly driven by insurance companies. 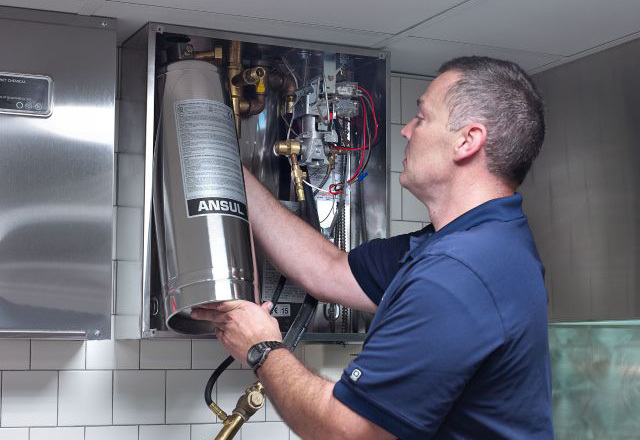 While we, like other companies, are waiting to see whether this new mist technology will catch on with end-users, these types of systems have some additional benefits over the traditional wet chemical systems, Ansul and Amerex. Cost, of course, is an issue that you can never escape from. While effective protection from fire risk offers long-term savings through minimum fire damage, business interruption and the mitigation of any threat to reputation, you’ll still find operators who regard it as nothing more than a necessary evil. The kitchen fire suppression system market is driven as much by regulation as it is technological change. Tyco’s Waldow is in agreement. “Ultimately, the cost of a fire suppression system is a fraction of the cost to either refurbish or rebuild a property that has suffered a commercial kitchen fire. 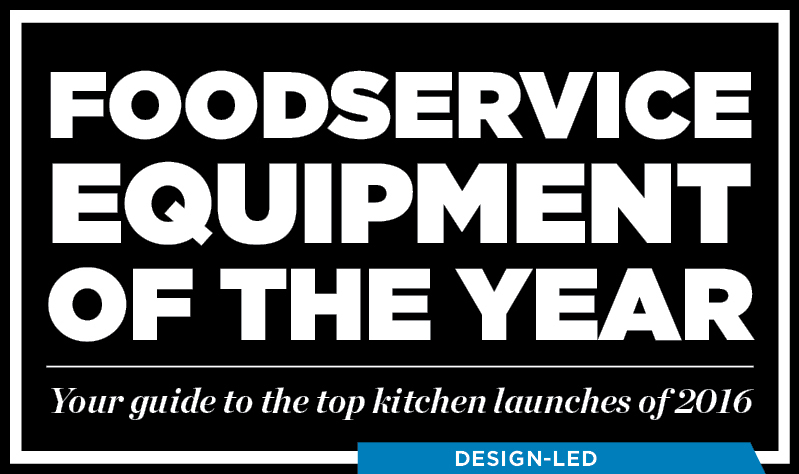 This equipment can also reduce risk of severe injury or even threat to life, as kitchen staff do not try to tackle the fire themselves,” he says. Stuart Dale, who looks after kitchen fire suppression system globally for Amerex Corporation, says that in order to fully understand the value a kitchen fire suppression system offers, you have to understand the risk that a business takes every day when it fires up its cooking appliances. “According to a study conducted by the National Fire Protection Association in 2012 there is an average of $356m (£268m) in direct property damage from fires in eating and drinking establishments in the US alone, and 57% of these fires start in the cooking appliances,” he comments. 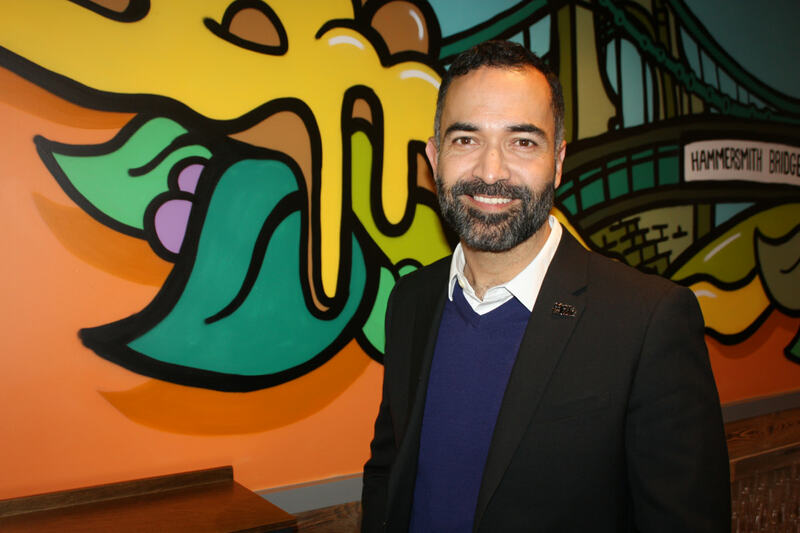 “Very few restaurants are capable of re-opening after a major fire incident. Kitchen fire suppression systems give the owner/operator, the staff and the public a quiet protection from injuries, damages and downtime,” adds Dale. One reason that kitchen operators might feel a little reticent about fire suppression systems is a failure to perceive them as a direct revenue generator in the same way as, perhaps, they would an item of prime cooking equipment. But FSE Fire Safety Systems’ Stuart Rye disagrees this is the case. 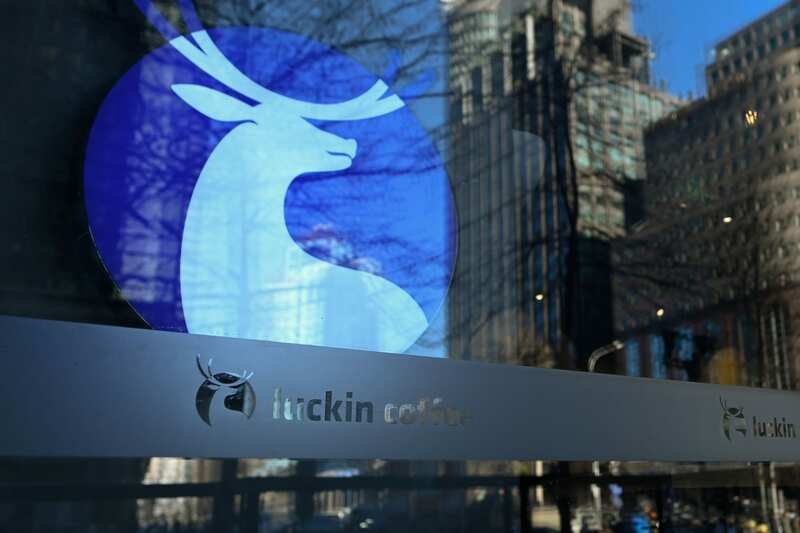 “We are currently working with one restaurant chain that has been able to increase the number of customers in the restaurant by decreasing the fire risk by the introduction of a kitchen fire suppression system. Therefore the maths are simple: one fire protection system equals higher revenues and therefore the investment in the kitchen suppression system should, in a relative short period of time, pay for itself,” he says. Ian Bartle, managing director of Nobel Fire Systems, says there are other financial advantages to bear in mind, too. “The insurance industry is the main driver for the installation of fire suppression and, as such, a small capital investment in a fire system can achieve savings in insurance premiums and ongoing insurance negotiations. This can have the effect of reducing overheads and contributing to the overall P&L bottom line,” he points out. The majority of good fire suppression systems are simple to operate and this is largely what makes them attractive, but commentators still expect the technology to evolve in line with customer needs by collecting real-time sensor data to optimise equipment performance, predictive maintenance, multi-property asset data and cost management. Any new systems will, of course, have to pass muster with insurers. Bartle at Nobel Fire Systems thinks the sensible changes will come from making the systems more intuitive and robust. He says that as technology moves forward, more will be expected of a fire system to monitor and advise the condition of a system both locally and remotely via WiFi and apps. The other prevailing trend is design aesthetics. 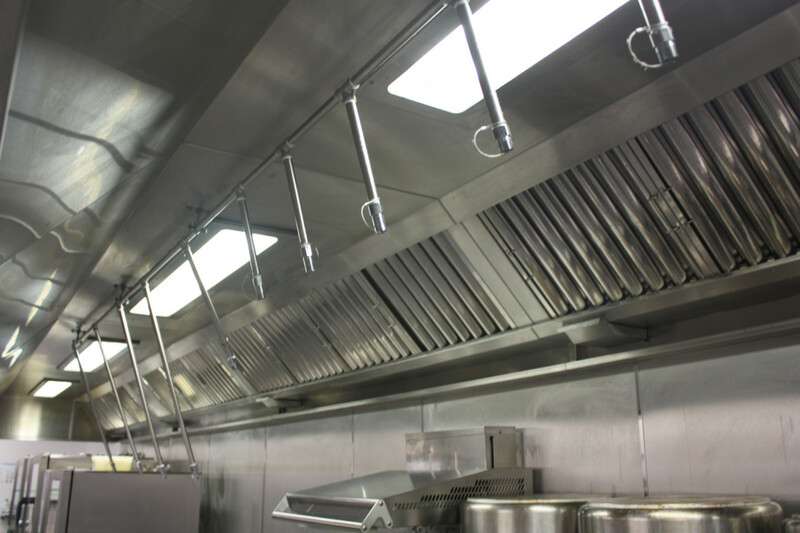 Suppliers have worked extremely hard to make their systems less intrusive, but the goal is to improve the aesthetics of a kitchen while still providing the reliable protection that restaurants need. Increasingly hood manufacturers are building the suppressant cylinders into the spine end of canopies and where systems are not retro-fitted some believe this is becoming the norm. Others, such as Ansul, are pioneering increased nozzle heights, enabling agent discharge nozzles to be installed 1.4 to 2.1 metres from the top of the hazard zone, meaning the system is completely unobtrusive to a kitchen’s configuration. 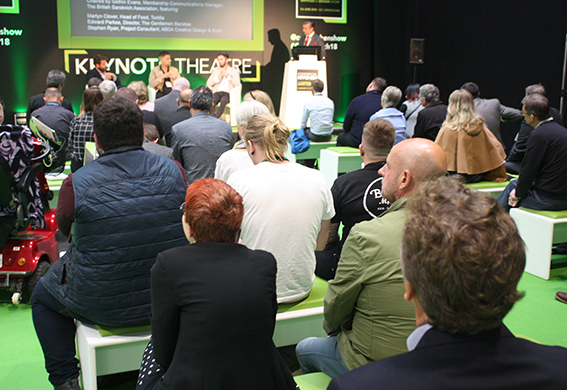 Ultimately, says Stokes at Assured Fire and Security, the single biggest thing for operators to ascertain is that the system they are using is designed correctly to cover all risks. 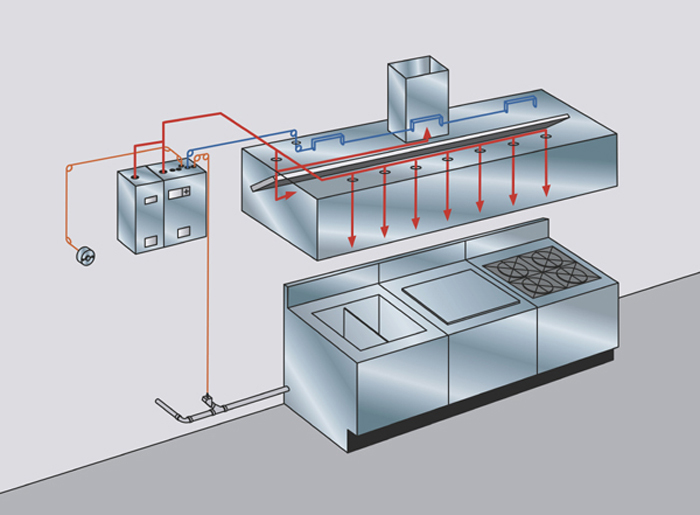 Systems must meet LPS 1223, the UK standard for kitchen fire suppression systems. The system needs to be robust and provide sensible life-time costs. The test protocol must also ensure effective agent distribution throughout the entire network of pipes and no splashing during discharge. Ensure that the installer is authorised to install the system. Check that engineers know what they are doing and have received the necessary manufacturer training. All pipework should be stainless steel and the system should be able to monitor itself for both fire and fault conditions so that any compromise of the system is announced audibly and visually and is never left to chance. 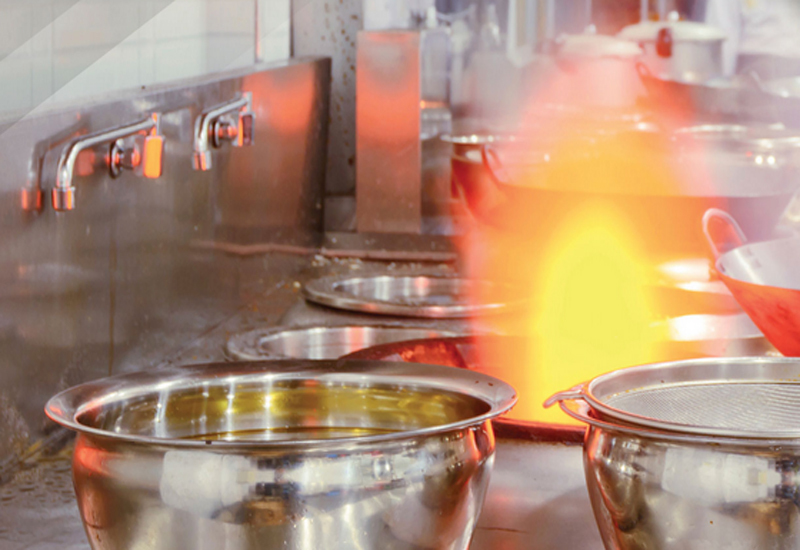 The fire suppression system needs to be fully performance-tested by a third party to protect all kitchen appliances and the ventilation system within a restaurant. 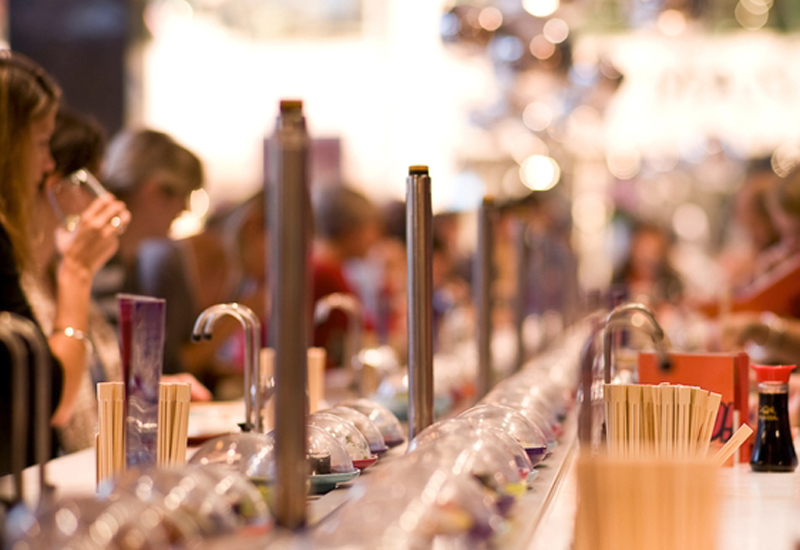 While the restaurant market has historically relied upon wet chemical fire suppression systems for kitchen protection, the emergence of watermist systems has added fresh impetus to the sector. But it still remains a challenge for resellers of these systems to get their product installed, even with LPS 1223 approval. “There are now a number of different manufacturers who use cylinders, not pumped systems like ourselves, but the development has been slow,” says Lee Haines, key account manager at Hydramist specialist Fireworks Fire Protection. Haines insists that while operators might be inclined to source the cheapest fire suppression product they can get away with, it would be much more beneficial to look at the bigger picture. “The total cost of replacing the kitchen in the event of a fire should be taken into effect,” he says. “The cost of covering all of the appliances and the ongoing costs of maintaining the system should be considered and this will affect the total cost of the system. It is important to look at the cost of the system over the lifetime and not just the initial cost of installation,” he adds. West Midlands-based Jactone, which has more than 35 years’ experience in the fire protection industry, is entering the kitchen fire suppression market for the first time. Its PAFSS KitchenGuard system works through pressurised detection tubing that is installed in front of the filters under the hood, behind the plenum and into the duct. In a fire situation the flame melts the pressurised tubing and a hole appears. 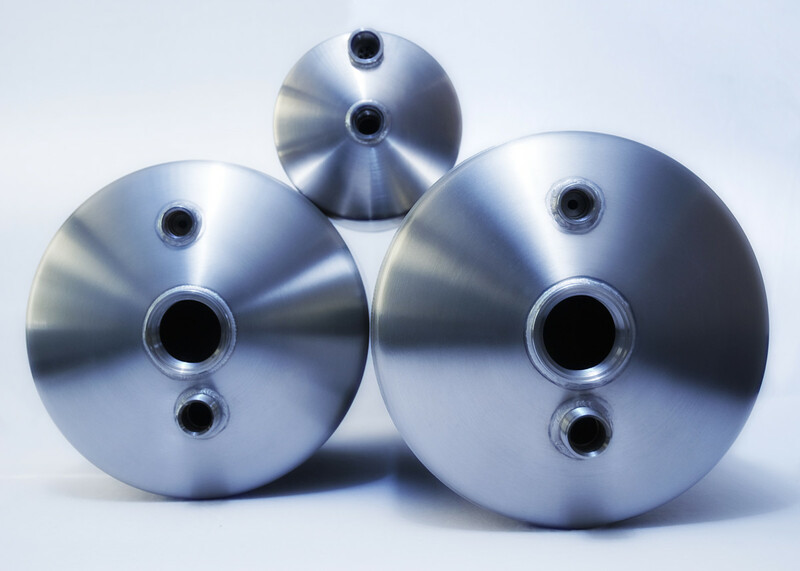 The drop in pressure in the tubing opens the valve on the system cylinder and wet chemical is delivered via a system of stainless steel pipework and nozzles onto the appliances, into the plenum and up into the duct. It claims this method results in faster fire detection and system activation, as the flexible tubing means there is an unlimited number of detection points. Jactone MD, Craig Halford, thinks the main driver for change in the market is the need to reduce the complexity of systems, while at the same time increasing their reliability. “A significant development is in the area of fire detection, where detection devices are now available that are not affected by oil contamination and are much more responsive, operating in the earlier stages of a real fire,” he says.